Fieldfare is a member of the thrush family. Its English name, dating back to at least the eleventh century, is obscure, though it seems to derive from an Anglo Saxon word feldefare meaning "traveller through the fields", probably from their constantly moving, foraging habits. This large grey headed thrush is a regular winter visitor to Arran. The first report this autumn was on 12 October. The previous winter, birds were reported from 11 October 2009 to 4 April 2010 and the winter before, the dates were from 30 September 2008 to 25 February 2009. 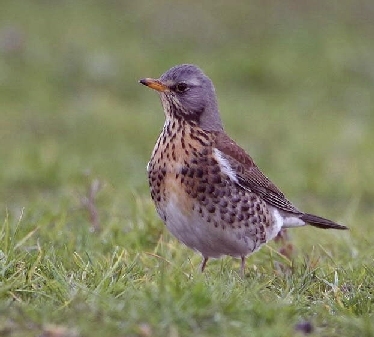 Look out for Fieldfare this winter. In winter and on passage, large flocks, sometimes mixed with Redwings and other thrushes, use open fields for foraging for invertebrates In addition berry bearing bushes such as hawthorns and rowan are particularly favoured in autumn and early winter until stripped. The numbers that remain on Arran over the winter are variable, probably influenced by availability of food and severity of weather, moving further south if the berry crop has failed. Fieldfares breed in woodland, parks and scrub in northern Europe, Scandinavia, the former Soviet Union and the Baltic States. In central Europe the breeding range has extended to Holland, Belgium, Germany, Switzerland and France. Unusually for a thrush, they often nest in small colonies, possibly for protection from large crows In Great Britain and Ireland it is a very rare breeder, but it winters in huge numbers here often with Redwing. One momentous movement occurred in Shetland between 20 and 28 October 1987 when an estimated one million birds came through. While Arran figures cannot match this, groups in the hundreds are not uncommon during the winter and during the autumn and spring migration.